Well, the end of the teaching year has come and gone, so it’s more than time to have a last look at the new assignments I put in place this year and to see how they went. I have to say that I don’t think my feelings have changed much since I did the mid-year review, but it’s good to close the circle. I also wonder whether the reason my thoughts haven’t changed much is because I didn’t do enough myself as a teacher to change what was happening, or whether the way I incorporated the assignments in the first place simply wasn’t right. I should note that although I picked up some new courses in the spring term (most significantly the Augustan and imperial literature core course), I did not make any innovations in how I was teaching those courses. (The additional workload may also explain why I didn’t make more of an effort with the new assessment strategies I felt were failing after the first term.) For the Augustan course, this was a simple matter of survival as there was a lot to prepare and cover, and mastery of the material was more important than innovative teaching with a course that was compulsory for so many students. However, I think I may have missed a trick with Latin IV, where I could have done some more interesting things with the teaching and how I chose to approach language instruction. That said, I did pick an unusual text (some of Seneca’s Epistulae Morales), and given all the other things I had on my plate for spring, that was probably enough extra innovation to work with. Learning journals/reflective journals: the update on these continued to be poor, particularly the reflective journals for the religion lecture, and I’m afraid I wasn’t proactive enough a personal tutor to keep pressing my first years on their learning journals. I do think that this has got some potential as a tool, in a pastoral rather than a teaching setting, and I need to think about how best to optimise that, but I suspect I’m not going to go back to the journal as a teaching tool until I’ve seriously rethought it and read around a bit more about UK-specific successes with the strategy. Blog posts: I continue to be really pleased with the way that these worked to get students thinking about secondary literature and engaging with it properly. Some of my colleagues have done other interesting things with blogs to get students to engage with primary sources in a similarly reflective way; perhaps next time I’ll think about doing something like that as well, if there’s an appropriate source to use. But I’m delighted to have finally found a way to get students to critically engage with secondary literature in a fairly deep and thoughtful manner that helps them develop the sorts of skills I want them using as they deal with that body of material in a supportive and useful environment. The one thing I do want to think about is how to get students commenting on each other’s blogs more – they were good at posting the original entries and at discussing responses in seminar, but less at engaging in discussion on-line. The Critical Incident Questionnaire: my use of this has really made me think that I need to do more with it. I want to try using it with other classes and see what sort of responses I get. I’ve asked the students from the epic seminar to give me some feedback, but I think there’s some scope here for a bit of concentrated research and thinking about it as a strategy within classics more broadly. For that, I’ll need more students to experiment on… but this definitely feels like a technique with some potential. Twitter: now, I’ve had a bit of a volte-face on this. The introduction of hash tags for each course definitely didn’t work – but over the last term, I’ve had more and more IAA students following me on Twitter. The Latin IV students have been particularly vocal, including one student who used the medium to arrange a pre-exam meeting to go over some passages we hadn’t got to in class. I know my colleague in Law Martin George uses Twitter a lot to communicate with his students off-site (as it were); I’m wondering whether this more informal kind of contact, where students find you if they want you, is a more useful way of encouraging continued thinking about the subject than trying to impose formal hashtags and assessments which work better in an American-style assessment system (where students can hypothetically be given credit for participating in out-of-classroom discussions – much harder to work into a UK marking scheme, especially whilst in a one year position). What I end up trying next year on the basis of this will depend on what I end up doing next year… so stay tuned! I got into a discussion on Twitter last night with @RuthFT and @BoneGirlPhD about required texts and their role in syllabi. Ruth expressed shock that a US student might be expected to shell out $100+ for their required books for each course each semester, Kristina wondered how UK students all kept doing the same thing without a required text, and the conversation went from there. What is very clear to me, as someone who has worked in both the UK and the US systems, is that there’s a really big culture difference here. The fact that UK students are studying a single subject and US students are studying cross a broad range makes a real difference to the expectations courses have of how students will use textbooks and secondary literature. In the US, for first year courses, you assume your students know nothing. Not a thing. You begin from a base point of nul point and build up from there – and, what do you know, there’s a whole market of textbooks that will help you teach Word Power 101 or World History 101 or Chemistry 101, and will essentially write your syllabus for you, and provide all the information and structure that your course needs, and of course your student needs that textbook (in the current edition, naturally) because that’s what the assignments and the readings are going to come from, and it essentially serves as the liferaft for the whole course. In the UK, the assumptions are very different. We give students a list of recommended reading – proper secondary literature, journal articles, books and chapters of books – and expect them to bring the quality of their work up to speed. There’s a much smaller market for textbooks written specifically for the university market, because university lecturers here tend to assume that the best way of getting undergrads comfortable with secondary literature is to plunge them in at the deep end and see if they swim. The base-line of the A-level gives us a guarantee that this material won’t be completely unfamiliar, so a university’s job is to move the dialogue beyond that point. We give our students some direction on how to do independent research, point them in the direction of a library, and see how they do. The thing is that in the UK, we can get away with it. The A-level system means there’s a knowledge base we can take for granted. 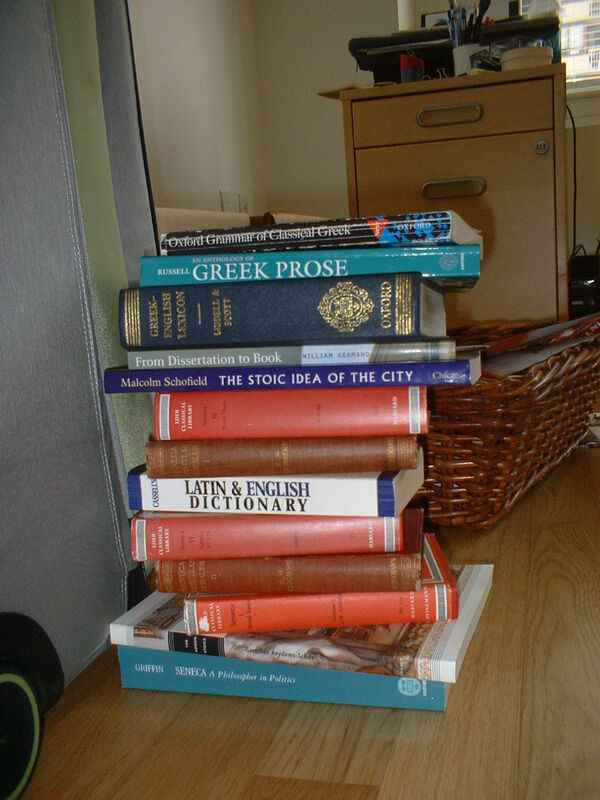 We are also teaching students the norms of reading and writing in a single field – once you have got the hang of the conventions in, for instance, Roman poetry, you’ll probably be more or less alright in Greek prose. The skills you spend building up during that first rather anxious term are going to serve you in good stead for the rest of your undergraduate degree. Students in the US, however, aren’t building up that kind of a depth in a field. Over their college careers, they will take one course in classics/physics/geology, to fulfill whatever core requirement that needs its box ticked, and then they will never look at the subject again. I know that if I have to navigate secondary literature in different fields, it takes me quite a while to work out the conventions of (for instance) sociological research as I go – and that’s for an article that I want to read, and that should have at least one point of contact with material I’m already familiar with. For US students to be dealing with courses that essentially pull them in three (or four, or five) different disciplinary directions each term would be an absolute intellectual nightmare. When your attention is spread over very diverse fields rather than concentrated in one, suddenly the attraction of a course that’s taught to the textbook becomes very clear indeed. Another thing nobody ever tells you about life after the Ph.D. (along with the pain you will suffer when you have to return your library books) is that once you graduate, you are exiled from the network of academic resources you have come to rely on, and to which you feel connected as through an intellectual umbilical cord. You no longer have access to an academic library, with a small team of specialised Library Fairies to hunt down that obscure book from 1937 that someone cited in a footnote as peculiarly relevant to your argument. How do you hack not being affiliated to a university, when you are in that strange half-life when you haven’t yet obtained a proper academic job with another university whose library resources you can then use? My academic life is currently a bit on the backburner because we’re preparing to make the move back to the UK at the end of this month. We’re spending a lot of our time working out what should go into boxes, putting the selected things into boxes, and then trying to work out what to do with the things that aren’t going into boxes. So far I’ve taken two ruddy great big bags of linens and clothes for textile recycling courtesy of the NYC Greenmarkets; we’ve got another couple of bags’ worth to go. The ‘non-essential’ books have been boxed up, although it’s a bit disturbing that when I was asked to put aside the books that I’d want to keep on hand until they had to go in the packing cases, I ended up with quite a substantial tower. I’m also experiencing considerable resistance to packing away my stationary. “What if I need that yellow highlighter or the special pen or the pencil with the owl on the end?” my inner scholar cries, unable to bear the thought of being separated from such vital equipment for the month or so that it will take for the shipping container to make i t from the US to the UK. Still, the movers arrive on Thursday next week, so whatever is in boxes will go, and whatever is not in boxes will be rehomed, recycled, binned, or put into a sneaky things-we-should-have-packed-but-forgot box and posted at the last minute. We don’t leave until the end of the month, so it’s quite nice to be doing this all in stages rather than having to do the sorting and the packing and the recycling all in one intense burst. That said, it’s still quite a stressful experience, and it doesn’t leave a great deal of energy spare for doing anything that isn’t absolutely essential. When I first came over to the US, I had three suitcases of stuff, did a run to the nearest Target to get essentials like bed linen and desk lamps, and then managed from there. It’s a bit odd to actually be shipping my academic library off to the other side of the Atlantic after arriving with so little in the first place. It’s also a bit odd to be doing this in the middle of trying to maintain an academic profile. I’m desperate to get some further work done on the Stoic exile article, or else I’ll have my writing group raising a quizzical eyebrow at me, but that’s having to take second place to things like cancelling direct debits and sorting out the boxes. While all of that’s going on, things around here may be a little bit quieter, but normal service should be restored before the end of July. You may have noticed a bit of a flurry over A.C. Grayling’s plans to launch a private university, the New College of the Humanities (previously known to Companies House as Grayling Hall after two of the founders). From the college’s website, it plans to offer degrees in Law, Economics, History, English Literature and Philosophy (although as of yet it doesn’t have its own degree-granting powers, and plans to register students for degrees through the University of London International Programmes). However, the difference is that students will take “three core subjects together with a Professional Skills course“. Which, to me, looks very much like the sort of general core curriculum required by American universities, and specifically those which would be considered Small Liberal Arts Colleges, or SLACs. Indeed, A.C. Grayling has said that the NCH is trying to “make use of an American-style model“. What I wanted to think about for a moment, apart from all the other issues (some of which Mary Beard has already outlined), is this question of transferring a SLAC model to the UK. Of course, NCH isn’t exactly like a SLAC. Most SLACs have excellent science programs as well as humanities programs, plus they pride themselves on the quality of their teaching – not just on their ‘star power’ lecturers. It is perfectly normal for SLACs not to have students at the Masters and PhD level, something that NCH has come under fire for, but this doesn’t stop their academic staff being involved in the wider research culture of their fields. The production of Masters and PhD students tends to fall to universities in the R1 (short for Research 1) category, whose focus is on research rather than teaching; research students therefore fit better into the ‘mission’ of R1s than they do into that of SLACs. The UK, of course, doesn’t have anything like such a clearly defined set of roles for its institutions, and you might make the case that NCH is potentially contributing a useful new model to the UK by pointing out that institutions can, in fact, focus purely on undergrad teaching. But stepping back from the NCH for a moment, there is a serious point here. Can the SLAC model actually be transferred to the UK? Is this a feasible project to begin with, never mind the failings with the NCH’s specific instantiation of that project? I had a further thought about the Pompeii exhibition in Times Square over the weekend, specifically about the comparative absence of slavery. My feelings about slavery are very different to those of the vast majority of the American audience who will see the current incarnation of this exhibition. I come from a British environment, where the inheritance of slavery is more or less invisible unless you specifically explore the Empire’s participation in the slave trade in the colonies, which was abolished by the Slave Trade Act of 1807 (followed by the Slavery Abolition Act of 1833, which made the practice of owning slaves itself illegal). We never had slaves in England itself on the same scale as America, and as such we do not have a similar legacy. We have no equivalent of Jim Crow, of segregation, of the Montgomery bus boycotts, of Martin Luther King. I have had to internalise these things and remind myself that this is the cultural world my students inhabit, even if it is not mine. When I teach, I am very aware that the word ‘slavery’ has a certain resonance, certain implications, that I have to break down at once. I have to tell my students explicitly and with no messing about that Roman slavery is a very different beast, it’s not race-based, it has more fluidity to it than ante-bellum American slavery, and that they have to rewire their brains to work with this material. It’s hard, it’s delicate, and it takes at least fifteen minutes of focused, careful explanation to lay the groundwork for tackling the subject for the rest of the semester. I can’t ignore the subject when I’m teaching. The topic is too interwoven into every topic, every source, that I want to use with my students. But Discovery don’t have the luxury of a captive audience, or of taking fifteen minutes of carefully prepared discussion to make sure that their visitors are absolutely clear on the differences between Roman and American ante-bellum slavery. They can’t afford to take the risk that something will be misunderstood when the topic in hand is such a loaded one for American culture. As they don’t have the luxury of giving their popular audience the kind of in-depth instruction that making this distinction requires, they simply elide as much of slavery as they can. I still don’t think that you can give an accurate picture of Roman society without talking about slavery and acknowledging its role. But given the audience that Discovery is targeting, and the practical challenges you face when you educate people about something this tricky and delicate, I can see why they decided to gloss over this potential minefield.